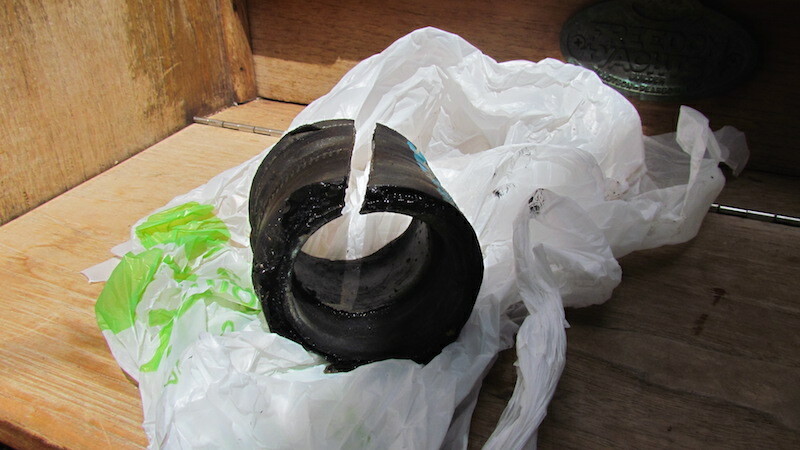 Sooner or later, every boat needs to have its stuffing box repacked or replaced. 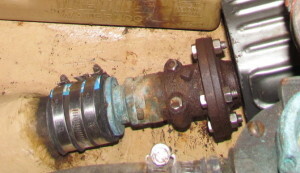 For those who’ve never heard of a stuffing box – a group to which I belonged when we first bought Sunshine – a stuffing box, also called a shaft seal, is a device that surrounds the propeller shaft and the part of the hull through which the shaft enters, creating a seal that lets in very little water. It’s vital to the boat continuing to float. When the engine was invented and boat owners decided they wanted to propel their vessels with steam or petrochemicals instead of wind, they first mounted those engines outside and attached them to paddle wheels. Then someone decided the engine would be better off inside the boat attached to a propeller. But moving it presented a difficulty because the propeller still had to be out in the water. In order to make this arrangement work, a hole had to be punched in the hull. No mariner worth his salt wants to go to sea in a vessel with a hole through it, so there has to be a stopper of some kind in the equation. 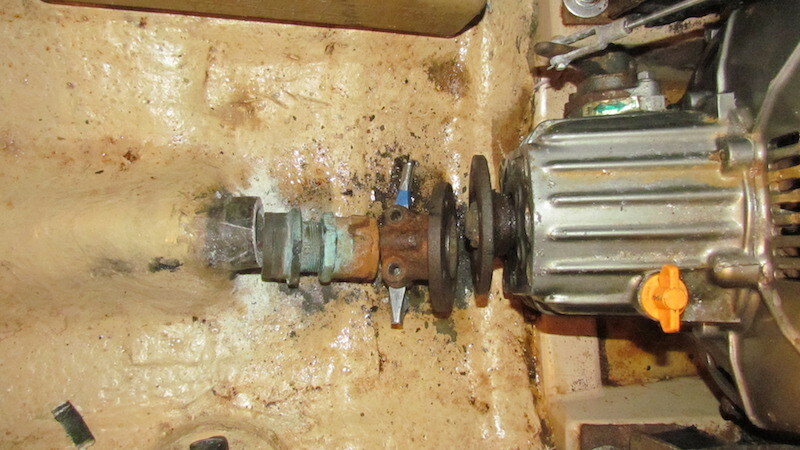 But the propeller shaft also has to spin, so a typical stopper wasn’t going to cut it here. The stuffing box is the solution some clever pants came up with to solve this very specific problem. Essentially, they created a seal out of flax cord and wax and held it in place around the shaft with a big bronze nut. Here’s what it looks like. With very minor refinements, that same nut and cord arrangement has been in use in millions of boats and ships for over 150 years. It wasn’t until recent advancements in composite technology that a better shaft seal became possible. A stuffing box always drips. If it’s in good condition, that drip should come every five seconds or so. If it comes faster, then you need to either repack it with a new flax cord, or replace the stuffing box. A modern shaft seal may or may not drip. Some are called dripless, and most come close to living up to the name, though in reality, none is completely free of the odd bit of moisture. And all must be maintained (tightened, kept free of corrosion, etc) to remain as dripless as possible. 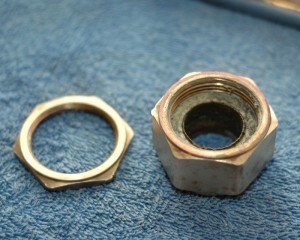 We really should have given Sunshine’s traditional bronze stuffing box some attention before we launched. She’d been sitting on the hard for at least five years when we acquired her. 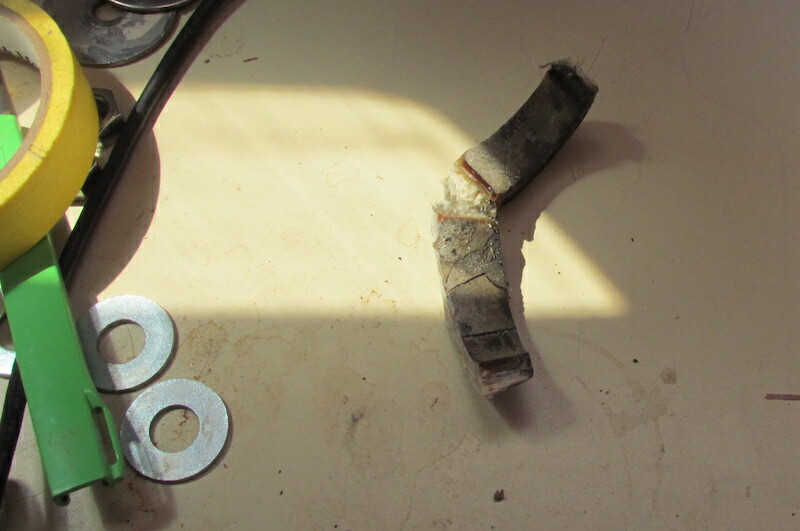 Any number of things could have happened to her stuffing box … corrosion, dri ed out packing, overheated wax. In fact, the seal could have been going bad before her former owner hauled her. That might have been the first item on his winter fix-it list. We had no idea. Though it did look well used. We thought about doing the job while she was still on the hard. We could have removed the stuffing box and repacked it with new flax cord and saved ourselves a lot of effort, worry and expense. But with all we had to do, we decided not to. We gambled. And we lost. The drip when we launched her was okay. Sitting at the dock while we finished our preparations, the seal only dripped every few seconds, maybe three, maybe four. A livable amount. But then we took to the waterway and before we’d gone five miles, the stuffing box loosened and the drip became much worse. When the engine was off the problem was almost unnoticeable, one drip maybe every second. But when it was on and the shaft spinning, it flung water all over the engine room. It wasn’t a gusher, but it was too much, and might become a gusher if we kept going. But this went down on December 20th. All the marinas were closed for the holidays. By the time they reopened, the Boston winter had moved in, with its ice and blizzards, giving Tom plenty of time to play with ideas for how to get the job done. 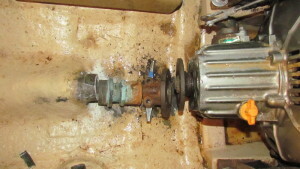 As long as we were going to be doing the work, we decided moving to the new high tech type of shaft seal would be wise. It would last longer, would never need repacking and would drip less, if at all. We considered several brands of dripless shaft seals. On the advice of Paul Dennis, of Warren River Boatworks, we chose the Tides Marine Series One model. Paul was installing these on all his Freedom 30s as they’re the shortest and come closest to fitting in the very limited space available. Take the boat out of the water – we did this by intentional grounding, a tactic more often seen in the UK than in Boston, MA. We are lucky in that ours is a “split coupling,” it opens partially, allowing it to move along the shaft. 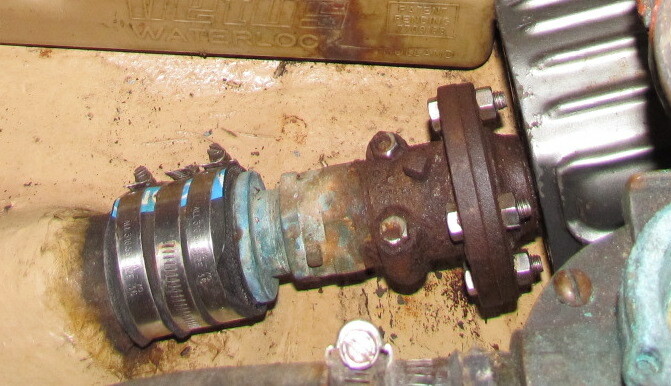 Some couplings have to be removed with a puller. If Sunshine had one of those we’d have had to unbolt the whole engine and move it forward to allow enough space to work on the stuffing box. The split coupling has to be wedged open. 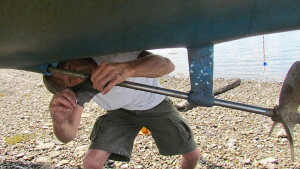 Foreseeing some difficulty due to corrosion, and space constraints, Tom designed a tool to help him open the coupling. In the end he didn’t use this. To save space again, he cut the tips off two screw drivers and used the tips as wedges to help spread the coupling apart. Remove growth from the shaft with very fine sand paper. Call tech support at least once. 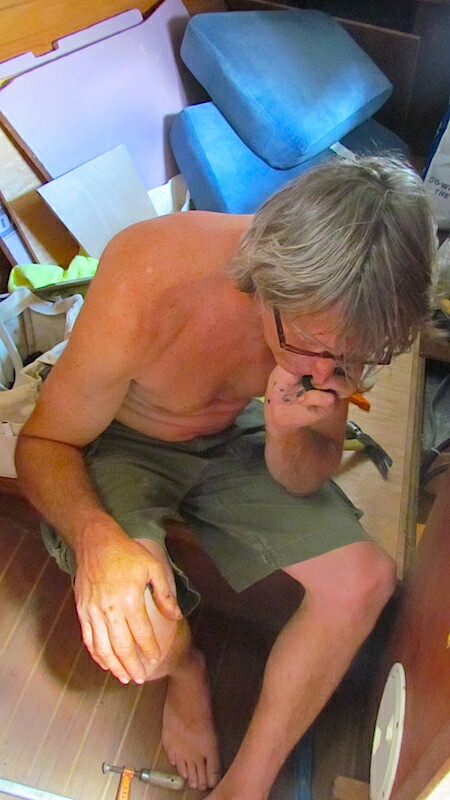 In the case of our stuffing box to shaft seal transition, Tom needed pointers from our mechanic, Jason and our Freedom Yachts guru, Paul when he ran up against sticky bits. We believe it’s always a good idea to have the requisite experts on speed dial before starting a project. 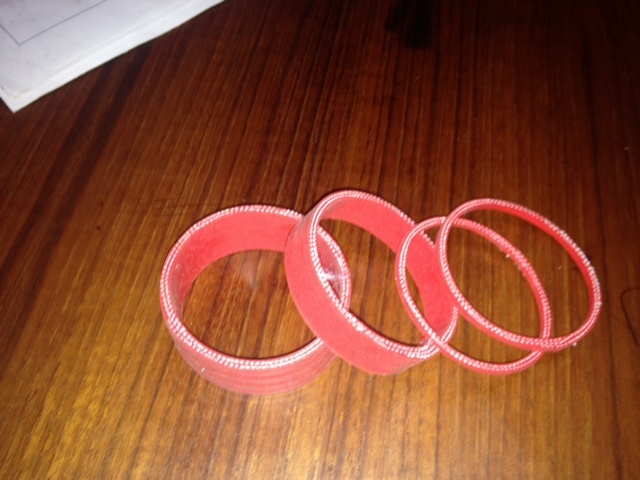 Prepare new stuffing box by cutting the hose to fit – measure thrice cut once. Tom did this in advance, since we were racing the tide, if you’re on dry land you can do it in place. Install hose on shaft log and attach using two hose clamps. Tighten the clamps until the hose is good and secure, but not so much that they’re digging into the rubber. Slide prop shaft back in through new stuffing box and into the coupling. Bolt the splitter back together. Double and triple check all connections. Put the boat back in the water. Or merrily wait for the tide. While I spent a number of years as a technical writer, and Tom is quite good at repairs, this is not intended as the definitive instruction manual on how to install a stuffing box. Rather, it’s a story about taking the bull by the horns and doing a job yourself. 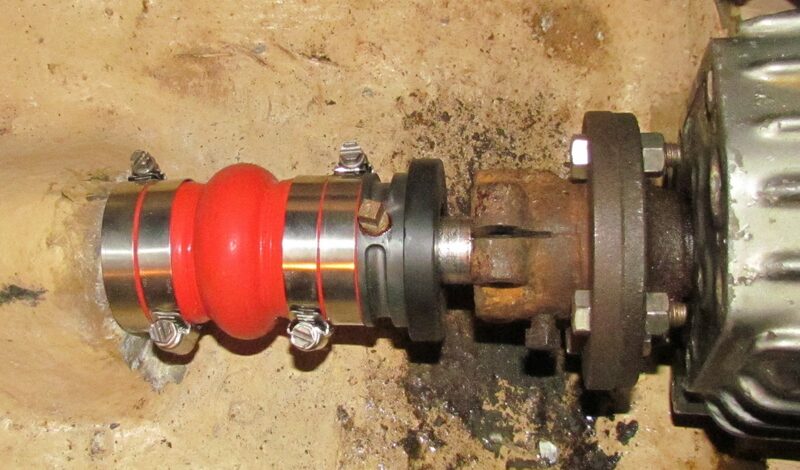 You can find complete articles on how to remove or repack a traditional bronze stuffing box and how to install a modern shaft seal at Compass Marine, a site that specializes in clear, interesting and accessible instruction on boat repair. Thanks to RC Collins for his very helpful site. I’ve used his image of the inside of an old style stuffing box like the one we removed from Sunshine without permission but am hoping for forgiveness.